Rev. Patrick J. Durkin, CSV, died at 6:30 p.m. on Sunday, August 14, 2011 at St. Joseph’s Home for the Elderly in Palatine, IL, where he had been cared for by the Little Sisters of the Poor. He was 85. Fr. Durkin was preceded in death by his parents, Michael and Anna (nee Ryan) Durkin, his sister Norine Accettura and his brother Harry Cerjak. He is survived by his brother and sister-in-law, William and Virginia Cerjak, along with many nieces, nephews and great nieces and nephews. Fr. Durkin first professed vows as a Viatorian on August 16, 1945 and his final vows on January 1, 1950. 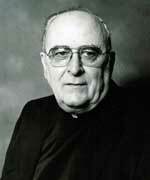 He was ordained to the priesthood by Bishop Bernard Shiel on May 18, 1952 in Chicago. He earned a Bachelor of Science degree in biology from St. Ambrose College, Davenport, IA and a Master of Science in physiology from Catholic University of America in Washington D.C.
His early teaching career took him to Spalding Institute in Peoria, IL, St. Philip High School in Chicago and Cathedral Boys/Griffin High School in Springfield, IL, before he joined the founding staff of Saint Viator High School in Arlington Heights, IL when it opened in 1961. He served as the first dean of men at the all-boys school and also taught biology. His legacy remains preserved, as the school celebrates its 50th anniversary this year and issues its collectible hard cover history book which includes Fr. Durkin’s contributions. In 1970, after nearly 10 years at Saint Viator High School and nearly 20 years of teaching and working with teens, Fr. Durkin started a second career. 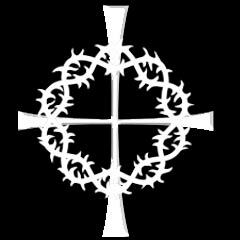 He studied to be a mental health chaplain in Independence, IA, and served as chaplain at Manteno State Hospital in Manteno, IL from 1971-1981. From there, Fr. Durkin headed west and served as director of pastoral care at O’Connor Hospital in San Jose, CA from 1981-1988 and at St. Jude Hospital in Fullerton, CA from 1988-1995. He retired in La Mesa, CA in 1995 and later moved to Las Vegas, NV. In 2010, Fr. 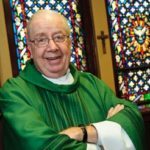 Durkin relocated to the retirement residence at the Viatorian Province Center in Arlington Heights, IL, where he lived until he moved to St. Joseph’s Home for the Elderly earlier this year. Visitation took place from 9:00 a.m. to 10:30 a.m. on Thursday, August 18, 2011 at St. Joseph’s Home for the Elderly, (Little Sisters of the Poor) located at 80 W. Northwest Highway, Palatine, IL. A Mass of Christian Burial immediately followed the visitation. Interment was in the Viatorian plot at Queen of Heaven Cemetery in Hillside, IL. Please remember Fr. Durkin in your Masses and prayers.